SMARTePLANS work by letting the viewer launch high definition photographs out of the floor plan. NOW the property photos all make more sense because the viewer selectively chooses what they want to see — and by launching the photos “out” of the drawing, they can be viewed in relationship to the drawing. 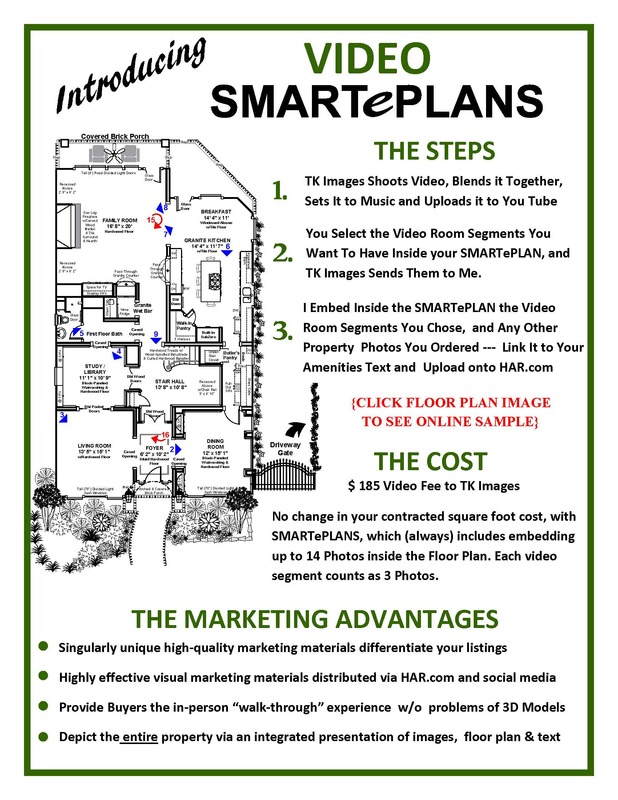 New for 2015, videos can also be embedded inside a SMARTePLAN, which provides the viewer with a 3-D “walk-through” experience. Working in cooperation with TK Images, one of the best real estate photographers in the city, we’ve jointly created a powerful and unique marketing product to showcase properties. This marketing system provides several important advantages when marketing a property and is used effectively both indoors and out. Review our preliminary tests using video, and see how it works well on this West University property in combination with still photos. In my opinion, the “best” method is using a combination of both photos and video on properties, and I look forward to speaking to you about it …and answering your questions.